Sea salt soap has been one of my best selling bath products over the years. The larger grains on top are purely decorative, while the fine sea salt throughout the bar slowly dissolves as the soap is used. Over time, the soap takes on the appearance of a smooth stone. Most of the salt soap bars can be used on the body or face. The first few times you use one, it will be slow to lather but be patient: as the edges begin to wear down it becomes easier to lather in the hands. Rubbed directly on wet skin, it acts as a gentle body polish and used with a nylon bath puff it will generate mountains of lather. It works well in hard and soft water and lasts for a very long time. Try it yourself and see why it remains one of my best-selling soaps ever. Above, our most popular specialty, sea salt soaps. TOP TO BOTTOM: Pink Sand, Dead Sea Mud, Marrakesh, Simply Salt, and our best-selling Sea Salt Soap. 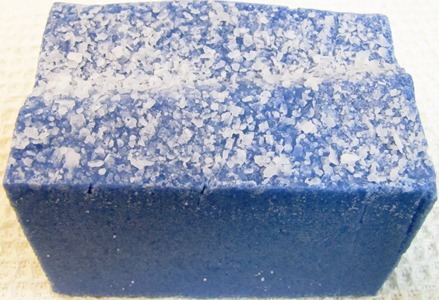 BELOW, our newest salt soap, Yemaya. No longer available as a sea salt soap - Marrakesh is now available in a 20% shea butter soap. You can find it on the alphabetical listing of soaps page.